This title is available from the International Dyslexia Association. Understanding Dyslexia and Other Learning Disabilities addresses how our educational system has failed to identify many children with learning disabilities and calls for the adoption of straightforward diagnostic techniques so that treatment options can be implemented at a young age. Many children who struggle with learning become discouraged in the classroom and isolated from their peers. Many adults whose learning disabilities were not recognized in school suffer from deep feelings of inadequacy that often prevent them from developing close relationships, finding rewarding employment, or living happily. 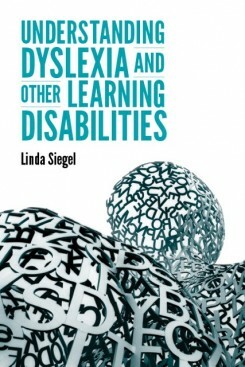 In this accessibly written book, Linda Siegel challenges the use of complex and time-consuming testing that is currently used to diagnose learning disabilities. In their place, she outlines simple and pragmatic techniques for testing for disabilities in reading, mathematics, spelling, and writing. The text is enlivened by first-hand accounts of people living with learning disabilities, case studies from literature, and profiles of highly accomplished individuals who have achieved success despite their learning disabilities. Their stories encourage people with learning challenges and those who support them to recognize and nurture each person’s special talents. Understanding Dyslexia and Other Learning Disabilities implores families, teachers, and other educational professionals to provide resources and services for all those struggling with learning so that no more lives are compromised. Linda Siegel is Professor Emeritus in the Department of Educational and Counselling Psychology, and Special Education at the University of British Columbia, Vancouver, Canada, where she holds the Dorothy C. Lam Chair in Special Education. She has conducted research on the development of reading and of mathematical concepts, language development, dyslexia, mathematical learning disabilities, early identification and intervention to prevent reading difficulties, and the development of reading and language skills in children learning English as a second language. She has consulted on the development of reading skills in elementary school age children in Hong Kong, China, Barbados, Brazil, Argentina, and many places in the US and Canada. In 2010, she was awarded the Gold Medal for Distinguished Contributions to Canadian Psychology from the Canadian Psychological Association. In 2012, she received the inaugural Eminent Researcher Award from the organization Learning Difficulties Australia. She has been awarded an honorary doctorate from the University of Gothenburg (Sweden). Chapter 20: Dyslexia and Murder? “Her book is packed with information for parents, teachers and for students themselves about the importance of early diagnosis of learning disabilities and how to get help, the best (and worst) remediation techniques, responses to intervention, examples of real children she has diagnosed and the tragedies of those who, unsupported, fell into despair.